Second in a series: New packaging options could help boost profitability, but testing and thermal issues remain problematic. MEMS devices inspire awe on the design side. On the test and manufacturing side, they evoke a different kind of reaction. These are, after all, the intersection of mechanical and electrical engineering—a joining of two miniature worlds that are the basis of some of the most complex technology on the planet. But getting these devices to yield sufficiently, understanding what does or does not work, and figuring out how to do this with the kind of economies of scale that have made semiconductors affordable present some monumental challenges in the MEMS world. • MEMS chips are like black boxes. In fact, they often are hermetically sealed because many of these devices need to work in a vacuum. That makes testing much more difficult. • Yield depends on other factors than just the MEMS device. Frequently these chips are packaged with other chips. Some are heat and pressure sensitive, and because it’s difficult to test these devices there is no simple way to determine reliability. • The competition for many of these devices is too high to warrant more investment, but the process of creating these chips can be slow and expensive. That disconnect limits innovation both in the process and in the MEMS devices themselves. Processes generally are well developed for accelerometers, gyroscopes and capacitive pressure sensors—the inertial sensors that represent the highest volume of the MEMS market. But that process is restrictive. Because of ROI, manufacturers are reluctant to change it once it is established. And even then, there are no guarantees these devices will work when they are combined in packages with other sensors. One of the emerging solutions for improving profitability involves new packaging schemes. Today, the majority of MEMS sensors are encapsulated in a polymer-based molding compound, which is used to protect them. There are other options available, including pre-molds and low-cost quad flat no-lead (QFN) packages, which improve the economics for MEMS devices, but with some limitations. Different packaging is available for different applications. But because the MEMS market is so fragmented, it’s not clear which of those approaches will become mainstream or how pricing will be scaled. Fig. 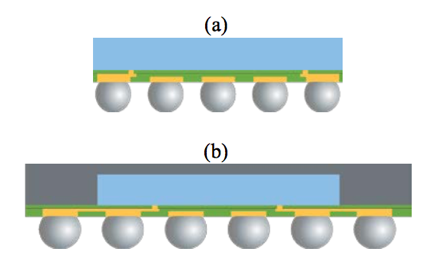 2: Fan-in (a) and fan-out (b) wafer-level packaging. Source: STATS ChipPAC. FO-WLP could play a significant role in sensor fusion because it allows multiple devices to be connected almost like LEGO blocks on a substrate. Ensuring that MEMS chips will work isn’t straightforward, however, and it gets more difficult as new packaging approaches are utilized. Fan-out wafer-level packaging requires testing the MEMS chip to make sure it’s a known good die before it is packaged. In addition, wafers need to be tested before and after they are “reconstituted.” This is critical because in some cases, different vendors supply the wafers and the MEMS devices. The challenge is making sure that the testing process doesn’t cause problems. Too much testing can damage sensitive parts. Too little testing, particularly of such effects as bias temperature instability, can allow unreliable parts to escape into the market. BTI is particularly problematic, and negative BTI is worse. As devices shrink, the threshold voltage shifts with applied stress. In the case of automotive applications that stress comes in the form of testing, which can be done at temperatures as high as 300° C.
Testing also is different for a closed device than one that is accessible. At the wafer level, for example, the primary consideration is yield. That’s an important piece of it. But there are other steps, too. Predictive analysis also is used on the design side, while output tests are used once a device has been packaged. Sometimes they don’t work with the package. Mike Rosa, director of technical marketing at Applied Materials, described one case where a company deposited aluminum on CMOS to create contact pads, and germanium on the MEMS device, and then bonded them together. Manufacturing of MEMS chips adds its own set of issues. Because of the downward pressure on average selling prices, many of the MEMS foundries utilize older technologies, where the up-front capital expense investments are lower. But the real economies of scale come from the new manufacturing processes and capabilities. Foundries generally weigh how much return they can expect from those kinds of investments, just as they do with other CMOS chips. 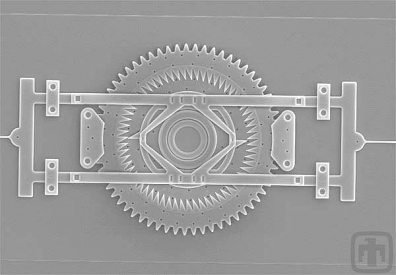 For the most part, MEMS chips are manufactured at 200mm today using fan-in approaches, primarily because the number of I/O connections is not that large with a MEMS device. Using that approach, the bumping is directly under the device. This is significantly different from a DSP, for example, which may have hundreds of I/Os, said Applied Materials’ Rosa. Where that becomes problematic is when devices shrink, such as a thinner phone, which in turn requires a smaller footprint to accommodate the new form factor. Demand for MEMS devices is forecast to grow significantly over the next few years, particularly as more sensors are required for devices that are either in motion or used to sense motion. This includes everything from cars to robots to electronic sniffers and ultrasonic fingerprint sensors. Some of these devices are produced in volume. Some are customized. And some are a bit of both. But the manufacturing and testing challenges aren’t getting easier, particularly as system vendors demand more reliability, smaller packages, and all for less money than they paid in the past. This remains a very tough market, and it’s only going to get tougher because the innovation demanded to meet these goals costs money, both in terms of up-front investments and equipment. Whether that results in more outsourcing, more standardization, or utilizing alternative, less expensive ways to sense the physical world remains to be seen. Changes are coming to this market. But what they will look like, when they will occur, and who ultimately will benefit from those changes is unknown at this point. Challenges increase across the board, but for different reasons. Low profits temper investments. Severe price erosion is putting this whole sector under pressure at a time when demand is growing. Advanced packaging issues in testing interposers, TSVs.